Keep your home cooler, while creating a stylish appearance all year round. Valor window awnings are created with durable, powder coated aluminum extrusions. Wall mounting hardware is electrostatic coated cast steel for greater strength and longevity. Modular construction allows roller and valance tubes to ship in two or three sections for easy transportation. Built-in manual crank mechanism is easy to operate with no maintenance and lateral drop arms can be positioned anywhere along the length of the roller tube to avoid obstructions on the wall. All necessary mounting hardware (for masonry installation), assembly and installation guide is included. Bird droppings, pine needles, and various air born materials that may settle on your awning; awning fabric should be cleaned using water and a light soap. No abrasive cleansers or harsh chemicals should be used on the fabric. 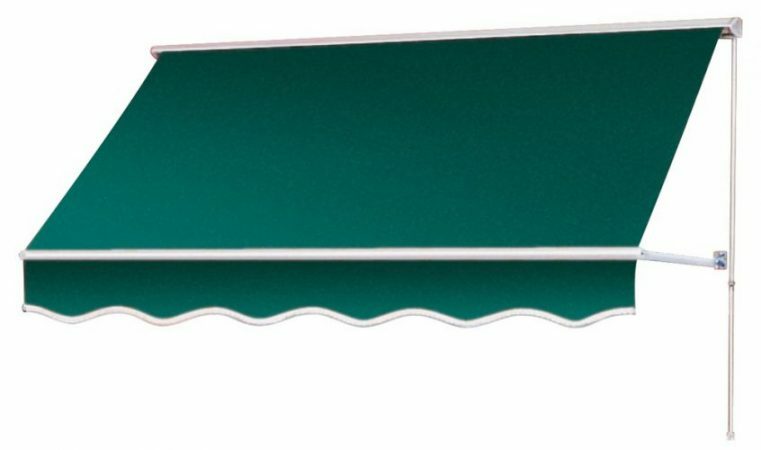 Damage to the awning (including the fabric) from any foreign material is not covered under our warranty. AW102836-**** 36" 28" 24" - 36"
Packaged: 1 unit per box. Fabric sold separately. Note: Replace the asterisks (****) shown in the Product No.’s above with your 4 digit colour code shown in the colour swatches below. Example: For a 36” Width x 28” Projection Window Awning, in Linen; Code would be: AW-103628-W001. All mounting hardware (for masonry installation), assembly and installation guide is included. Choose from 6 complimentary fabric colour options. Polyester Fabric with a Polyurethane coating to resist mould.